Damon Rich’s got his first taste of the wider forces at play in park design at his very first job, with the Parks Department of New York City. “I remember a park in Queens that had, like a lot of New York City parks, a big field,” the urban designer recalls. It had four softball fields, with their metal backstops on the perimeter. One day, a city councilman asked the parks department to pivot all those fields around so their home plates met in the middle. The backstory turned out to be a battle between softball players and soccer players, who had been playing in the open middle of the field, tearing up the outfield grass. The softball players were the ones who wanted those backstops in the middle, where they would block the soccer players’ game. For Rich, the takeaway was that every design decision “is imbued, especially in civic and public projects, in this infinitesimal fracturing of politics.” This idea is at the center of a Mural Arts Philadelphia exhibition that opens today at the nonprofit arts organization’s gallery. The Park Powers exhibition features large-scale drawings produced as part of an investigation into an aging public park in one of city’s most diverse census tracts that began last summer. In collaboration with Mural Arts and neighborhood partners, Rich and a crew of local teenagers who would act as the lead researchers began by asking a single question: What does South Philly have to do to get Mifflin Square Park rebuilt how it wants? This question, pursued in interviews with neighbors, local associations and city officials, was timely; the Southeast Asian Mutual Assistance Associations Coalition (SEAMAAC) is one of the partners who brought Rich to work in Philadelphia. With a grant from the William Penn Foundation, SEAMACC is now leading a coalition of organizations in creating a Community Plan for the park that they hope will lead to an improved space better equipped to serve the surrounding communities. A long-time area for refugee settlement, the densely packed blocks of rowhomes around Mifflin Square are shared by Cambodians and Bhutanese immigrants, African Americans, Latinos, as well as Italian and Irish-descended families who came to the city in earlier waves of immigration. In recent years, the area has also drawn young families seeking homes close to jobs in Center City and within walking distance of East Passyunk, a thriving corridor of shops and restaurants. With the changes have come new concerns about retaining the neighborhood’s diverse fabric and ensuring that longtime residents continue to have a voice in the planning process. 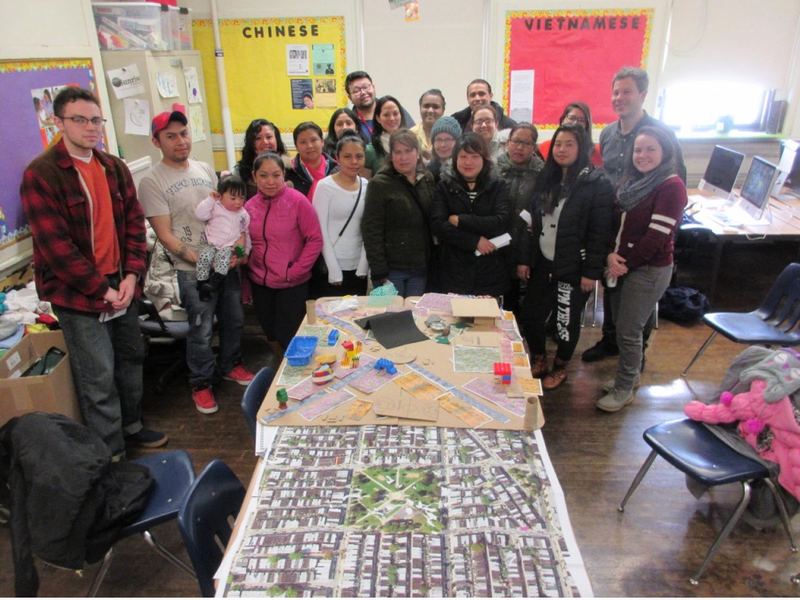 Working with residents of changing neighborhoods is nothing new for Rich, the founder of the Center for Urban Pedagogy (CUP), a New York City-based nonprofit which — despite including the word “pedagogy” in its title — aims to translate the jargon and tools of planning for a wider audience. Accountable development, he says, depends on the democratization of the design toolkit to let people who will use a space play a meaningful role. “The design process can be a support for organizing residents … and for [further] community planning,” he says. Newark was an appropriate place for Damon to try his approach. The New Jersey city was the first city in the country to hire an urban planner, back in 1914. Still today it bears visible scars from 20th-century urban renewal projects that tore away at the city’s fabric. Rich met people who had lived through the demolition of entire neighborhoods, including a man named Junius Williams, who led the resistance as a young lawyer. “Coming to work here was to step into this lineage which arguably had done some good things for the city but clearly had done a hella lot of destructive things,” says Rich. 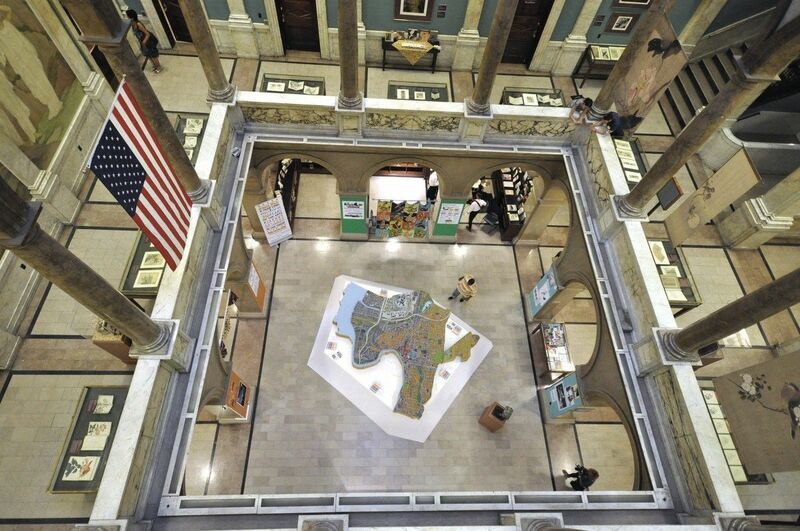 In the interim, the planning process was “almost completely occupied” by professionals, like architects, developers and engineers who did not necessarily live in Newark or talk much to those who did. In part because of this disconnect, the zoning code had not been comprehensively updated since the 1950s. The rules were “tremendously permissive,” says Rich, easy for people arguing for variances to interpret in their favor. This had led, he said, to the construction of buildings with few street-facing windows or even entrances facing the parking lot, even if few Newark residents drove. As part of the revamping of the code, he brought out the models and paper houses. At a series of workshops, residents weighed in on some of the basic rules to produce an environment they would like to live in. This process, he noted, also built the political momentum to get the citywide code passed, rather than becoming just another proposal in city filing cabinets. His time in Newark was nothing if not a good preparation for the neighborhood planning Rich is now doing in Philadelphia through his new design shop, Hector, co-founded by architect Jae Shin. Shin and Rich’s work is also a return to earlier work with CUP, focused on engagement just as much as the end design product. A pivotal moment came for the project when the area Councilman Mark Squilla told Rich and his crew of 15 teenagers that the challenge for a park wasn’t the million-dollar price tag of a rehab, but a shared vision. Hector was subsequently chosen by SEAMAAC and its partners to lead the next phase for Mifflin Park, coming up with a design that could be shopped back to the city and implemented. They began a series of 10 workshops, conducted in three languages. Cardboard models, Rich said, helped to demonstrate the trade-offs required to fit a baseball field versus, say, the community garden requested by Bhutanese residents. Larger gatherings will take place over the coming months and Hector will complete the much-anticipated product of all this deliberation by the end of the summer. If the plan is received well and that $1 million can indeed be found, South Philadelphia could have a newly renovated park within four years. Meanwhile, an upcoming exhibition will further spread Rich’s gospel of accountable development. A retrospective in the works with the Yerba Buena Center for the Arts in San Francisco will include projects spanning from his time with CUP to Hector, sharing the process underway in Philadelphia with new audiences. You are invited to see Damon Rich speak Thursday, April 6, at the Moore College of Art & Design in Philadelphia. Emma Jacobs is a multimedia journalist and podcast producer based in Paris. See more of her illustrations and follow her on Instagram.